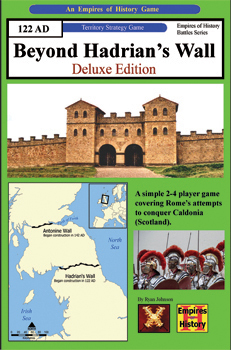 Beyond Hadrians Wall is an introductory historical board game covering the Roman era in Britain. In 122 Ad the Emperor Hadrian visited Britain and ordered the construction of the great wall separating Roman Britain from the Barbarians to the north. In the period after the walls construction the Romans would send a number of expeditions into Scotland to try and conquer the lose collection of tribes there known as the Caledonians. After some success the Wall of Antonine was built, bringing over a third of Scotland under Roman control. But it would not last. 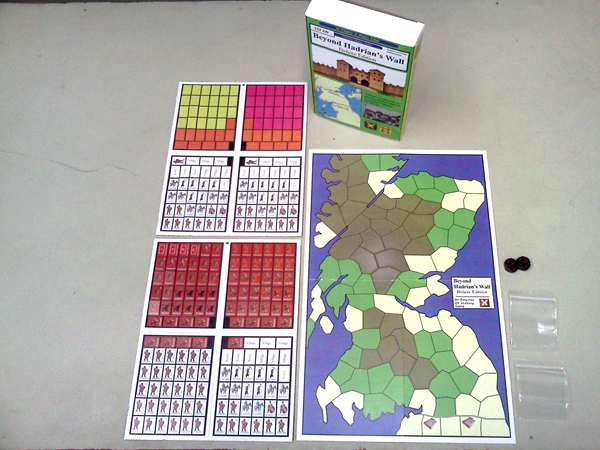 Beyond Hadrians Wall provides a 2-4 player game where up to 3 players assume control of Caledonian tribes and attempt to capture Hadrians Wall from Rome. Rome must attempt to conquer Scotland. The 4 player game allows for in fighting between the Caldonian tribes so there can be a single tribal victor (assuming they beat Rome).